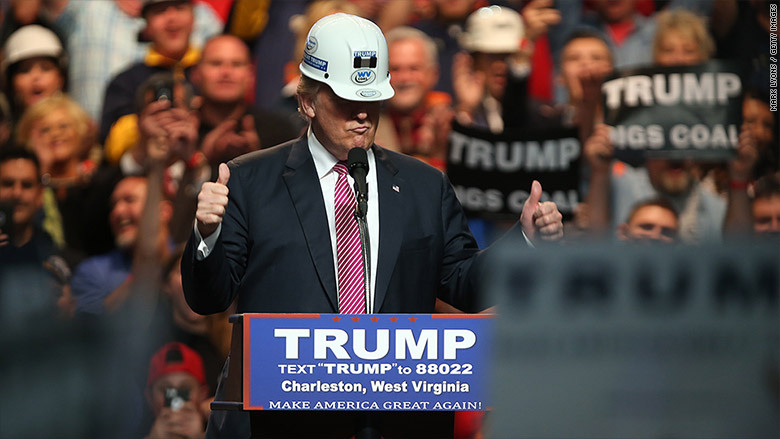 President-elect Donald Trump has promised to "save" America's coal country and put long-suffering miners back to work. But a top coal executive Robert Murray knows the daunting challenges facing his industry won't go away simply because Trump won. "I've suggested to Mr. Trump that he temper his expectations," Murray told CNNMoney. 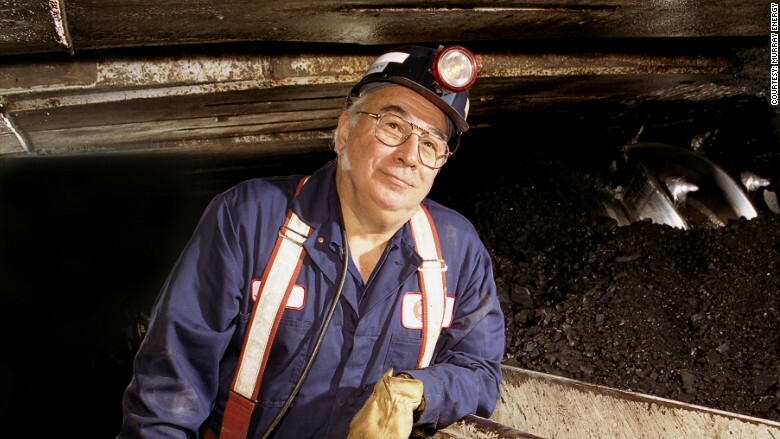 The 76-year-old CEO of Murray Energy, the largest U.S. private coal miner, said he spoke to Trump about this issue both before and after the election. Coal employment, Murray said, "can't be brought back to where it was before the election of Barack Obama." Besieged coal workers were among the country's Rust Belt voters that helped propel Trump to a stunning victory in November. And Trump in turn has promised to pull the plug on President Obama's "job-destroying" regulations. "For those miners, get ready because you're going to be working your asses off!" Trump said in a May speech. Murray, a fierce opponent of Obama, believes Trump has the "courage and commitment to stop the destruction of the coal industry." However, the CEO of Murray Energy added, "that will be about all he can initially do." 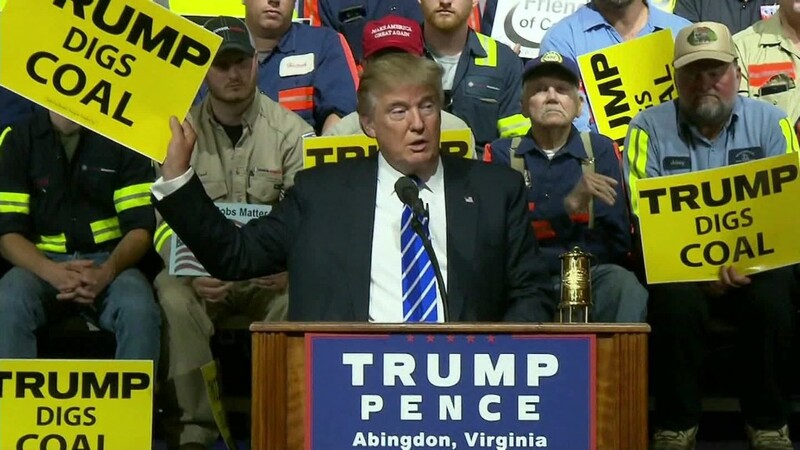 Robert Murray, CEO of coal miner Murray Energy, is hopeful that President-elect Donald Trump can stop the "destruction" of the coal industry. Related: What if Trump dumps Paris climate deal? 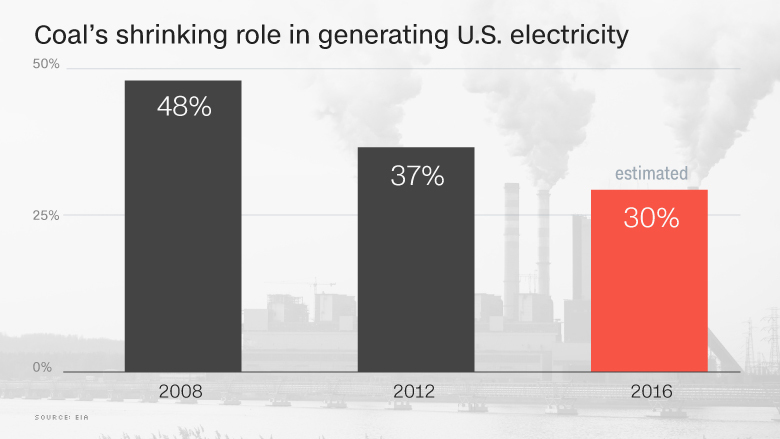 Murray noted that coal's role in supplying America's electricity is shrinking fast. Thanks to the abundance of U.S. natural gas from shale sources, coal's share of domestic electric generation has plunged to just around 30% this year, compared with nearly 50% in 2008, according to the Energy Information Administration. Murray is confident that Trump's promises to rip up Obama-era EPA regulations will prevent coal's market share from crumbling even further. "If he just stops it where it is, that will be a wonderful thing," Murray said. Wall Street analysts, like Murray, believe that coal faces tall odds in mounting a meaningful comeback in the short term. "Stay away, or be cautious, on dirty power," Brian Chin, U.S. electric utility analyst at Bank of America Merrill Lynch, said at a recent conference. He argued that natural gas has been the major driver of coal plant troubles and renewable energy sources like wind and solar continue to get cheaper. "The trend toward clean and green has been halted, but not reversed," Chin said. Longer term, Murray is optimistic that coal will "come back slightly" thanks to the development of technology that allows plants to use less coal and create fewer emissions. While Murray acknowledges the rise of natural gas, he more directly blames coal's demise on Obama, whom he called the "greatest destroyer that America ever had." Murray Energy has frequently clashed with the Obama administration, filing about a dozen lawsuits since he took office in 2009. The industry pressures have forced Murray Energy to aggressively cut jobs. The company's headcount peaked at 8,400 in May 2015, but today it employs 6,000 workers. Murray Energy had threatened to lay off another 4,400 workers in July due to financial stress. However, the miner said the layoffs did not take place as the company avoided defaulting on its debt. Still, most of the 400 workers at Murray Energy's Ohio Valley Coal subsidiary lost their jobs in November when the division shut down due to depleted coal reserves and the struggling coal market. Like many in the coal industry, Murray recalled that Hillary Clinton promised during the campaign to "put a lot of coal miners and coal companies out of business." Murray said many voters in coal country saw Clinton as an "extension" of Obama. "They don't want Hillary Clinton's welfare. They want jobs," he said. Research suggests that this storyline may have played a key role in Clinton's demise of support in the Rust Belt. According to labor market analytics firm Emsi, Trump won every single county in Michigan, Ohio, Wisconsin and three other Rustbelt states that have become more reliant on mining, manufacturing and agriculture jobs over the past 15 years. Now that Trump has won, coal workers around the country have sent an SOS to the president-elect to quickly stem the bleeding. Hundreds of coal workers sent an open letter on Thursday to Trump demanding "action that will bring relief to coal communities." Specifically, the coal workers called for legislation to protect miners' health and retirement benefits and to pay for the retraining of workers. The coal workers also called out coal CEOs and execs for continuing to "reap multi-million dollar bonuses" even while slashing jobs and proposing cuts to pensions.